This article is a continuation of WebGL 3D Point Lighting. If you haven't read that I suggest you start there. In the last article we covered point lighting where for every point on the surface of our object we compute the direction from the light to that point on the surface. We then do the same thing we did for directional lighting which is we took the dot product of the surface normal (the direction the surface is facing) and the light direction. This gave us a value of 1 if the two directions matched and should therefore be fully lit. 0 if the two directions were perpendicular and -1 if they were opposite. We used that value directly to multiply the color of the surface which gave us lighting. Spot lighting is only a very small change. In fact if you think creatively about the stuff we've done so far you might be able to derive your own solution. You can imagine a point light as a point with light going in all directions from that point. To make a spot light all we need to do is choose a direction from that point, this is the direction of our spotlight. Then, for every direction the light is going we could take the dot product of that direction with our chosen spotlight direction. We'd pick some arbitary limit and decide if we're within that limit we light. If we're not within that limit we don't light. In the diagram above we can see a light with rays going in all directions and printed on them is their dot product relative to the direction. We then have a specific direction that is the direction of the spotlight. We choose a limit (above it's in degrees). From the limit we compute a dot limit, we just take the cosine of the limit. If the dot product of our chosen direction of the spotlight to the direction of each ray of light is above the dot limit then we do the lighting. Otherwise no lighting. First let's modify our fragment shader from the last article. // Passed in from the vertex shader. Of course we need to look up the locations of the uniforms we just added. Another thing, and maybe this is just a personal preference, I don't like to use conditionals in shaders if possible. I think the reason is it used to be that shaders didn't actually have conditionals. If you added a conditional the shader compiler would expand the code with lots of multiply by 0 and 1 here and there to make it so there were not any actual conditionals in the code. That meant adding conditionals could make your code explode into combinitorial expansions. I'm not sure that's true anymore but let's get rid of the conditionals anyway just to show some techniques. You can decide yourself whether or not to use them. One other thing is right now the spotlight is super harsh. We're either inside the spotlight or not and things just turn black. To fix this we could use 2 limits instead of one, an inner limit and an outer limit. If we're inside the inner limit then use 1.0. If we're outside the outer limit then use 0.0. If we're between the inner limit and the outer limit then lerp between 1.0 and 0.0. Now we're getting something that looks more like a spotlight! GLSL also has a function we could use to slightly simplify this. It's called smoothstep and like step it returns a value from 0 to 1 but it takes both an lower and upper bound and lerps between 0 and 1 between those bounds. The difference is smoothstep uses a hermite interpolation instead of a linear interpolation. That means between lowerBound and upperBound it intepolates like the image below on the right whereas a linear interpolation is like the image on the left. It's up to you if you think the difference matters. One other thing to be aware is the smoothstep function has undefined results if the lowerBound is greater than or equal to upperBound. Having them be equal is the same issue we had above. The added issue of not being defined if lowerBound is greater than upperBound is new but for the purpose of a spotlight that should never be true. Several functions in GLSL are undefined for certain values. Trying to raise a negative number to a power with pow is one example since the result would be an imaginary number. We went over another example above with smoothstep. You need to try to be aware of these or else your shaders will get different results on different machines. The spec, in section 8 lists all the built in functions, what they do, and if there is any undefined behavior. Here's a list of undefined behaviors. Note genType means float, vec2, vec3, or vec4. Arc sine. Returns an angle whose sine is x. The range of values returned by this function is [−π/2, π/2] Results are undefined if ∣x∣ > 1. Arc cosine. Returns an angle whose cosine is x. The range of values returned by this function is [0, π]. Results are undefined if ∣x∣ > 1. Arc tangent. Returns an angle whose tangent is y/x. The signs of x and y are used to determine what quadrant the angle is in. The range of values returned by this function is [−π,π]. Results are undefined if x and y are both 0. 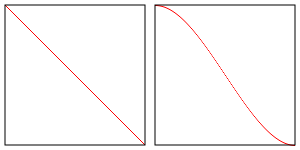 Arc hyperbolic cosine; returns the non-negative inverse of cosh. Results are undefined if x < 1. Arc hyperbolic tangent; returns the inverse of tanh. Results are undefined if ∣x∣≥1. Returns x raised to the y power, i.e., xy. Results are undefined if x < 0. Results are undefined if x = 0 and y <= 0. Returns the natural logarithm of x, i.e., returns the value y which satisfies the equation x = ey. Results are undefined if x <= 0. Returns the base 2 logarithm of x, i.e., returns the value y which satisfies the equation x=2y. Results are undefined if x <= 0. Returns √x . Results are undefined if x < 0. Returns 1/√x. Results are undefined if x <= 0. Results are undefined if edge0 >= edge1. Returns a matrix that is the inverse of m. The input matrix m is not modified. The values in the returned matrix are undefined if m is singular or poorlyconditioned (nearly singular).